To begin, we prepare the stuffing. Peel and pit the lychees and then finely mix the flesh. Beat the 2 eggs and mix with lychee puree. Pour the lychee puree in a saucepan with the sugar and the cornflour. Cook over low heat, stirring occasionally. A foam will form. As soon as it begins to cook the foam will disappear little by little it’s time to stir constantly to prevent the cream from burning. Once there is no more foam you must have a thick cream, continue stirring for another minute and take the pan off the heat. Add the butter and mix until all the butter is melted. Then add the mascarpone, mix well and reserve in the fridge. Preheat your oven to 180 °. Separate the egg whites from the yolks. Whip the yolks with the sugar until they whiten. Reserve. Beat the whites in snow. Mix the egg whites gently with the blanched yolks. Add the flour in 3 times and mix gently. On your baking sheet put a baking sheet and pour the dough on it. Smooth a little and bake for 10 minutes. As soon as you leave the oven, roll the sponge cake in a cloth and let cool a little. Peel and pit the 5 remaining lychees. Cut the lychee flesh into a small cube and set aside. Unwrap the sponge cake and garnish with lychee cream. Put the lychee cubes on the cream and roll tight again and reserve in the fridge. In a bowl put the mascarpone, the cream and the icing sugar and whip until having a firm cream. Take the rolled cake out of the fridge and cut both ends. 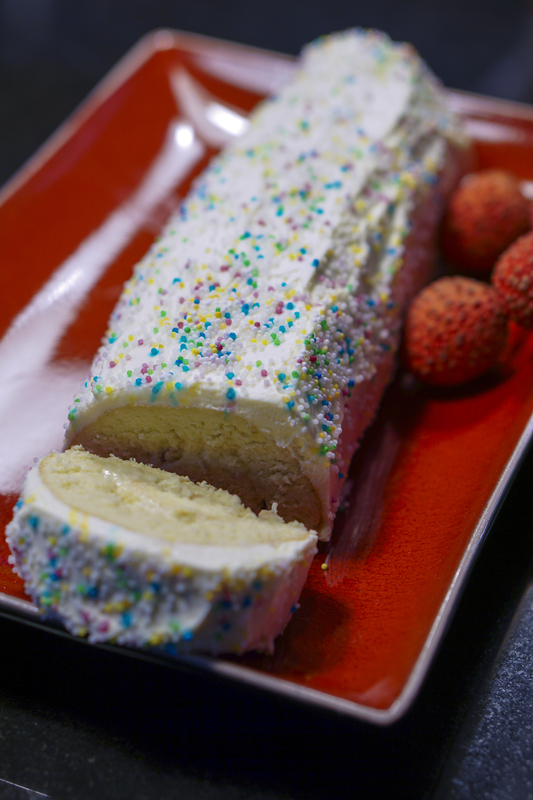 With a spatula decorate with cream, sprinkle with mini sugar pearls, cut into slices and enjoy your lychee swiss roll.